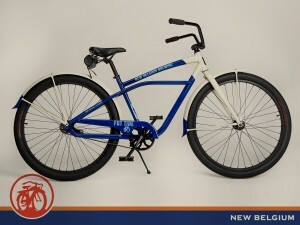 This year’s New Belgium Cruiser Bike Giveaway will benefit KLCC! Everyone who buys a New Belgium beer (bottle or draught) at The Bier Stein on Thursday November 20 will be entered in the raffle. Customers can also buy a raffle ticket for $1, with 100% of the proceeds going to KLCC. The raffle drawing will be held at 9 pm, and you MUST BE PRESENT TO WIN!The Bier Stein is located at 1591 Willamette Street in Eugene. Thank you Bier Stein & New Belgium Brewing! This is a deal you can’t pass-up! Feast on dinner the night before the ride and watch a Pedal Powered Movie in the Park (Pee Wee’s Big Adventure) while supporting the City of Eugen’s Adaptive Recreation program. After dinner, Eilee Thalheimer, author of Bicycle Sojourners will share with you the joys of touring and her experiences touring in Oregon. Then ride the Blackberry bRamble Sunday morning wearing your newly designed event jersey (click HERE to see jersey), all for $99. You save $29, you’ll be supporting the city’s adaptive cycling program, and you’ll have your registration in before we fill up. Click HERE to register. Okay, so you can’t do the ride because you’re volunteering on Sunday, August 4 or you have other commitments. You can still enjoy the Saturday’s dinner and movie plus the event jersey, both for $60. You save $29, you’ll be supporting the city’s adaptive cycling program, and you’ll get your cool bRamble jersey. This is also a good option if you plan to do the Community Ride (10-20 miles). Click HERE to purchase the Dinner/Jersey combo (then click HERE to register for the Community Ride). Remember the Blackberry bRamble Bike Celebration is open to all (no admission charge) and is on Sunday after the ride. We will have eclectic music, jugglers, demos, competitions, a skateboard contest food and vendor booths. Relax at the the Ninkasi Beer Garden with wine too. At 4pm many prizes will be raffled including a bike frame set, a set of wheels, a complete bike, gift cards and more. Hey folks! I haven’t posted in awhile, but luckily Shane has kept the site alive. I have a few weeks before grad school forces me back into hiding, so I’m going to try to cover as much as possible before then. A lot has been going on! The good news is that Eugene used a rapid readiness grant last year to do all the background research and planning to fix that area, so it’s now a “shovel ready” project that is just waiting for the money. This is good, since the path is now literally falling into the river, and the cracks threaten to swallow not only tires but entire joggers. But wait, there’s more! From GEARs: Why do YOU care about bikes? Why do YOU care about bikes? If you are reading this article, bicycling is probably important to you – I know it is to me, which is why I am currently the Chair of the Advocacy Committee. What we are looking for are stories illustrating how bicycle programs and infrastructure have made a difference in your life. What we are going to do with those stories is use them as compelling examples to elected officials on why we need their support. Today I have a repost from the GEARs website and the wonderful December InMotion from the City of Eugene. In related news, gradschool is finally on break, which means I can tackle my huge backlog of stories. Stay tuned! December will be a good month for WBE, and will feature more than just reposts. Also, in case you missed the Twitter post, WBE will be changing servers this December. I hope the server change will address our slowness issues. Before I repost the GEARs article about downtown bike parking, here is a quick recap of what has happened so far: Back in August I raised the issue that free downtown bike parking would lead to the lost of 165 downtown bike parking spots when 255 meter heads were removed (often two meter heads are on one pole.) I had already raised the issue on the GEARs mailing list back in February after reading this article in Momentum Magazine, but it didn’t garner much attention at the time. However, after my August post the GEARs advocacy sprang into high-gear and began talking with city officials, like Parking Services Manager Jeff Petry (who happens to also be a bike commuter), about replacing some of the meter heads with “bike hoops.” We don’t have those yet, but to solve some of the immediate need Petry seems to have thought “outside the box” and attached many of the new “free parking” signs to the old meter posts to preserve some of the bike parking. Take the jump to read the GEARs article about what is to come, and to read the December InMotion!